We believe passionately that everyone has a creative spark that can be fanned into a flame using jazz music. Our goal is to inspire all the kids in the audience to feel empowered to follow their own path to self-expression, just as we as jazz musicians have done. We use the medium of creative music to help them see the possibilities of this expression and hope to bring them the excitement that has made jazz music popular throughout the world. When, after the performance, we hear a young person say how much they love jazz, we know we have done our job. The David Leonhardt Jazz Group is a critically acclaimed acoustic ensemble that plays a blend of mainstream and modern jazz. 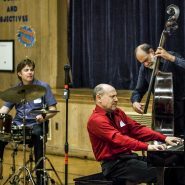 The group relies on creative improvisation, playing both jazz standards and originals. The Jazz Group appears in performance as a trio of piano, bass, and drums or as a quintet with saxophone and vocals. They bring a high level of musicianship and intensity to each performance. The response the group has received from their concerts has been overwhelming. 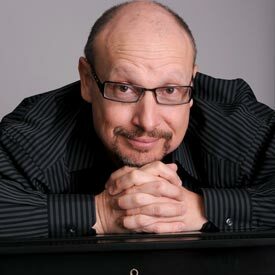 David Leonhardt, jazz pianist and composer, is a highly skilled and versatile artist. His thirty years of professional experience has included recordings, T.V. and radio, concerts and festivals, night clubs, and stage shows. He has appeared internationally throughout North and South America, Europe, and the Middle and Far East with some of the biggest names in jazz. He is the founder and president of Big Bang Records. Performing and studying as a teenager in Louisville, Kentucky, with noted educator Jamey Aebersold, Mr. Leonhardt acquired his skills backing such diverse jazz talents as Buddy Defranco, Dave Liebman, and Buddy Tate. After moving to New York City in his twenties, Mr. Leonhardt established himself as an international performing artist when he toured for four years as pianist for jazz legend Jon Hendricks, accompanying vocalists such as Diane Reeves and Bobby McFarren. Joining The David “Fathead” Newman Quintet, he furthered his reputation as a burning jazz pianist and made his name familiar on the New York jazz scene. He went on to form his own band, performing in the U.S., Japan, and Europe. Mr. Leonhardt has produced, arranged, and performed on numerous recordings with jazz stars Stan Getz, Slide Hampton, Jon Hendricks, Eddie Henderson, Robin Eubanks, Ray Drummond, and Lewis Nash. His compositions have been recorded by such jazz greats as Stanley Turentine, David “Fathead” Newman, Hank Crawford, and Claudio Roditi. He has written arrangements for the Art Blakey Big Band and been guest conductor and arranger for the Benny Carter Orchestra. At present, Mr. Leonhardt is leading his own band with successful appearances at the International Arts Festival of Shenzen in China, the Winnipeg Jazz Festival, the French Maison de Dance in Lyon, as well festivals and concerts throughout the United States. His all-star group has been heard at the Apollo Theater, the Blue Note, Birdland, and Sweet Basil . He is a well-known educator, gives clinics worldwide, and has written for the magazine Piano Today. Mr. Leonhardt is on the roster of Pennsylvania Performance Arts on Tour. David Leonhardt is a consummate professional. His expert musicianship enhances the performance and celebrates the best of what makes great jazz. David Leonhardt and company deliver just what the audience is looking for in a jazz program.